This is a handmade one of a kind piece that is sure to get attention whether featuring a lovely hat/wig or just sitting on its own as a sculpture. The base of the head is made from Styrofoam up-cycled from a beauty salon. The bottom features a hand-carved weighted wooden base to keep it upright. It is covered in pages from various 1940's magazine ads and railroad journals. The advertisements really make this piece stand out. Each mannequin head has its own look and name. No two are ever the same. The facial features are all hand crafted from antique magazines and hand placed to the form inside. The vintage buttons are hand placed along with the hand wrapped rope ribbon that lines the bottom of the form. Lillian's neck features a twine/lace choker with a button centerpiece. 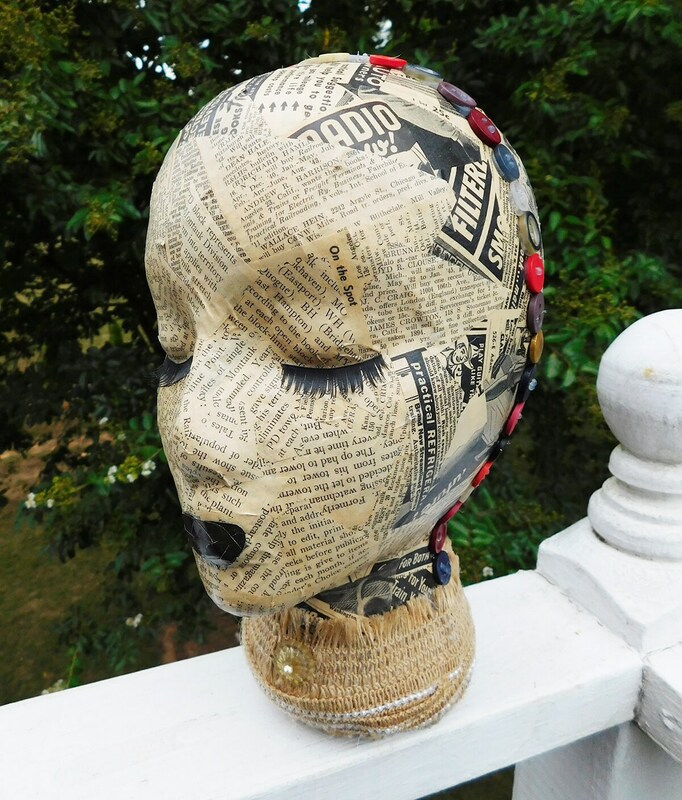 All materials used in this piece were upcycled from vintage or antique products. The head measures 10.5 inches tall and fits most all hats and/or wigs. This sculpture was also coated in an archival seal to keep the colors and paper vibrant for many years to come. Please check out our other mannequin sculptures and vintage products.